As global industry leaders with an established reputation for premium service an quality, Toni&Guy have had a loyal clientele for a number of years. However, with younger generations becoming more money-conscious and contemporary new salons entering the market, we needed to create awareness and excitement around Toni&Guy with younger demographics. The management team at Toni&Guy wanted to showcase the quality and ethos of Toni&Guy as a brand as well as the uniqueness of the Brighton salon, and the specific talents of their staff. Considering their desire to grow an awareness and engagement with younger audiences, we knew Instagram was the ideal platform to focus our efforts. In terms of content for Instagram, we decided to combine quotes on black backgrounds with white text with high-quality images from the stylists to showcase their work (pictured right). The result is a stylish tiled feed that aligns with the Toni&Guy brand perfectly, as well as having connotations of beauty and symmetry... a great way to represent the quality of the Toni&Guy stylist's work. During an initial 3 month trial period, we used paid advertising to ensure a big impact over this short timeframe. We ran initial awareness campaigns showcasing the quality of Toni&Guy and then retargeted those who engaged with a discount offer to use over the summer. This in conjunction with the organic content strategy has achieved fantastic results for Toni&Guy, through which we secured additional contracts with the brand. An average growth in the number of new clients by 32% per month over the previous 2 months. 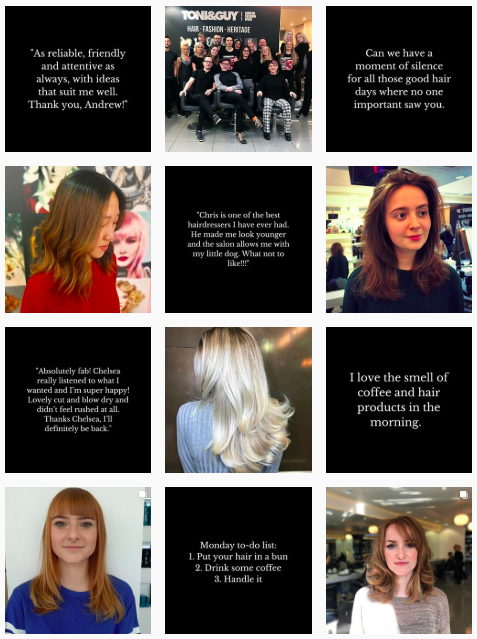 A beautiful Instagram account that operates as an extension of the Toni&Guy brand, and a tool for reaching and engaging with ideal clients. Developed an awareness of Toni&Guy with younger demographics. Are you ready to get social media working for your business? A clear social media strategy aligned with your business goals and customer profiles and tailored to your sector and budgets will make a positive impact on your business in the short term and ensure you’re not left behind in the long term.